It used to be that a project for a vertical bagger addition, upgrade or replacement was primarily an engineering project. Sure, there was some guidance from product marketing and merchandising folks, and purchasing was involved in negotiating the terms of the deal, but line engineers led the effort. Today that's changed. Cross functional teams look for opportunities to optimize functions and product lines. Multi-disciplinary teams weigh in on capital equipment discussions. While that makes the job of the equipment manufacturer more complex, it generally results in better equipment decisions from the perspective of the buyer. Sometimes, in fact, changes in a vertical baggers format can compliment small changes in product - combining to create block buster success. In an article in the September issue of Harvard Business Review, legendary innovation expert Clay Christensen digs into the innovation behind Hershey's Reese's Minis. Obviously the big news here is the product change itself. But reading it (if you're in the packaging world) you're probably asking yourself what role the resealable feature played and how important the flat-bottom bag was to success. Would a Doy pack or gussetted bag have worked? Of course we can't know - but it's reasonable to speculate that the combination of those two features in conjunction with the product change all contributed to the rare, successful innovation which Christensen cites. So what does that mean to ongoing VFFS projects? It's simply not enough for you to know how to make your product, or for a capital equipment manufacturer to know it's technology. The Hershey's example highlights the importance of understanding use patterns and consumption habits. 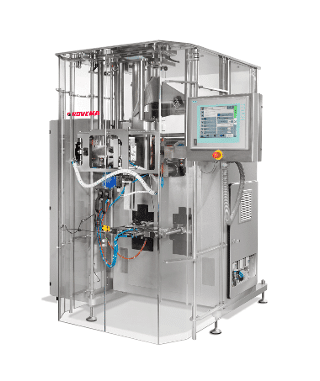 Procter and Gamble is famous for their observation approach to innovation, and increasingly we're seeing companies incorporating new capabilities of packaging, available through improvements in machinery and materials, to create new value in their products. While we're meticulous about observing our confidentiality obligations (both formally documented in MNDAs and assumed) we're also uniquely positioned to collect and share broad industry trends and insights. Perhaps more importantly, we have the perspective to draw on trends in unrelated industries to contribute to break-out innovation. Of course it's not quite so simple. A great concept is of little value if it's impractical to produce at scale. And operational OEE imperatives don't excuse being dismissive of the compelling priorities faced by marketing and sales. A VFFS great machinery supplier needs to not only help you understand and satisfy your customers' jobs, but to understand yours as well. The buying teams involved in complex equipment and product decisions demand a broad based business empathy with expertise in each discipline. That's tough to find - rare and valuable when you do. And as Christensen points out, it could be the difference between a smooth machine project (that's a baseline expectation) and a commercial success! While retail aesthetics, shelf life and convenience are recognized attributes of vertical bags there's an extensive potential range of value that can be designed into a package. Capable, reliable, flexible machinery is an important element of this of course. But thoughtful, broad & deep industry and consumer product insights are the real expertise. Want to compare the hardware? Check out our free downloadable machine comparison matrix. Want to understand our expertise and how we can help you? Call us today!